Verified Purchase This throw was a big hit. Kids especially liked tenting under it playing hide and seek. Cotton, it held up well washing and drying; colors stayed bright, no fading or running. Love it! 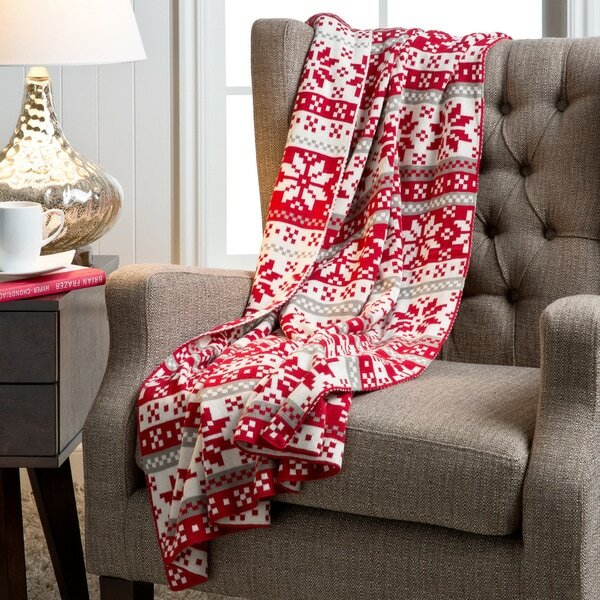 From Fab Habitat comes this knitted cotton throw in vivid red, grey and white hues and a chic Nordic pattern. This throws is designed to keep you warm from the cold and add an attractive accent to your living space. Story Behind the Art: Making beauty out of sustainable and reclaimed materials is the specialty of Fab Habitat. Founded by husband and wife team Kanan and Suchin Gupta, they smartly chose to employ artisans from the Northern region of India, long an area famous for weaving. Often using traditional jacquard or Punjab looms, these makers give recycled cotton, plastic bottles, and cartons new life as gorgeous, eye-popping rugs, poufs, and doormats. Happily, this not only enriches the lives of the weavers, but keeps a traditional technique alive by giving it a fabulously contemporary spin. All rugs by Fab Habitat are certified by GoodWeave - a nonprofit dedicated to ending child labor in the carpet industry. This throw was a big hit over the holidays. Kids especially liked tenting under it playing hide and seek. Cotton, it held up well washing and drying; colors stayed bright, no fading or running. Still out since the pattern is more winter than Christmas. Love it! I received this throw on yesterday, the material is soft, I was a little disappointed at the color, although the color is as shown, however, the red is not as vibrant and the white is a little dull. The colors stay true even after washing, It is soft and beautiful. This product made me become an Overstock customer! I absolutely love this throw. It is good sized and heavy. Perfect for the cold Midwestern winters. Colors are very vibrant and work well with our other holiday decor. Washes well and is holding up well. THIS BEAUTIFUL, soft throw launders like a breeze and comes out softer and more luxurious than ever. It’s the perfect size and weight to take the chill off a frosty evening or morning. I’m going to order more! This really is as beautiful in person as it is in the picture. It's so soft and cozy! I got it as a throw for the family room, and our boys also love using it to curl up and watch t.v. This was a great buy! I thought it was going to be cheaply made because of the price but it was worth the chance. It was very festive and matches my other decor. Good quality, really cute, soft, comfortable. I love it. I have it on my chaise to cuddle up in. Matches Christmas decor for next year and it was a good price.